I started today with an odd-sized piece of watercolor paper. It was the last one on the pad and I thought it was time to make use of it. I broke up the wide dimension by using masking tape to divide the paper into three sections. I penciled-in arcs and sharp angles in the middle section and painted the outer sections with turquoise. After it dried, I moved the tape to protect the green-blue sections. I used rust-colored quinacridone burnt orange to color the middle section, painting over the pencil lines. To my chagrin, there were some gaps between the turquoise end panels and the central area; the rust color from the central section bled under the masking tape in a couple of places. I covered both imperfections with two thick, black, vertical lines. Kandinsky inspired the acute angled shapes and curves. The final imprecision in this post is the distortion of the line dividing the leftmost panel from the central section. The paper was buckled when I took its photo. The vertical dividing line therefore appears curved. I like the vertical black lines even though they were added as an afterthought. 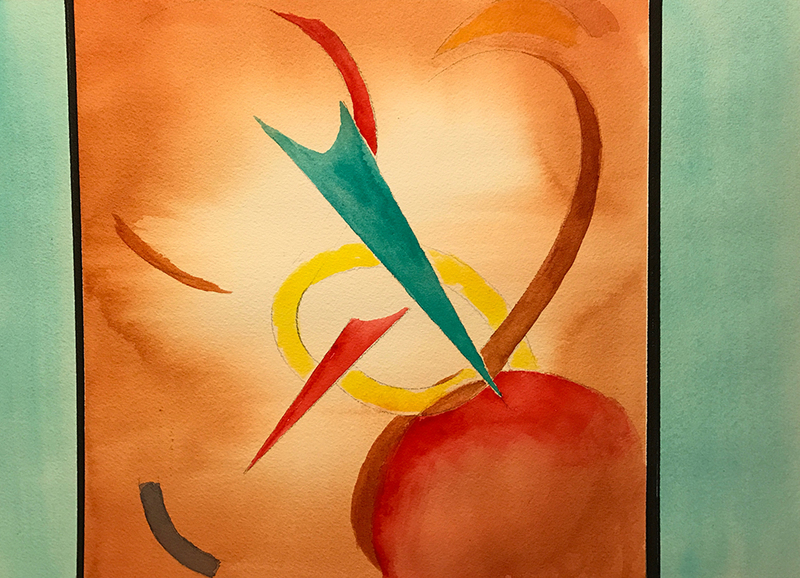 This entry was posted in Personal Stories and tagged abstract art, abstract expressionism, art, artistic process, creative process, creativity, painting, visual arts, Wassily Kandinsky, watercolor. Bookmark the permalink. Thanks for the comment, Bridget. Interesting observation. The black lines are the best way to get maximal contrast and separation between panels. The reason for separating them was to re-size the original picture space. Okay, but the black lines are a bit isolated at the moment. Include them by putting a few bits into the main pic. It could be a great picture.